A few weeks back I made plans to attend the keynote address for the GYRE Symposium on plastic pollution in the ocean that was being held at the Centers for Disease Control. As it turned out, I was running early - not unusual for me - and the conference was running late - not unusual for conferences - so I arrived just in time to catch the end of an earlier presentation. In some respects it was good timing. The speaker, whose name remains unknown to me, was describing a very successful urban gardening project. His optimism about providing quality nutrition for African-Americans and others living in the inner city who lack ready access to sources fresh fruits and vegetables was inspiring. What was also inspiring was his way of speaking. His cadences and phrasing were characteristic of those of black preachers from the Baptist pulpit, whose voices were notably raised in support of civil rights and social justice in the middle of the last century. There is little doubt in my mind that when the world looks back on the American contribution to public speaking 500 years from now, Martin Luther King, Jr., along with Abraham Lincoln, will stand at the top of the list of orators this country has produced. King's "I have a Dream" speech surely belongs to the ages. But there is an element of this rhetorical style which I find problematic. And that is the use of a memorable and amusing quip that reduces a complex issue to a catchphrase. Johnny Cochran's masterful, "if it doesn't fit, you must acquit," is a good example of how this kind of soundbite can be wielded in the courtroom. He used it to good effect in the defense of his client O.J. Simpson during Simpson's 1995 murder trial. I don't fault the late Mr. Cochran for exploiting this technique; his job as defense attorney was to further the interests of his client, not to lay out to the jury out a thorough analysis of the pros and cons of voting for or against a conviction. But the impact of his words in this context illustrates how an argument in favor a position for a complicated situation can be reduced to a very simple slogan. A more notorious example arose from the pulpit in the 1990's. It emerged at a time when the battle for gay rights was gaining traction in mainstream America and the movement dared to say the name "civil rights" in describing itself. Much of the African American religious community took this comparison as an insult to their own hard-fought struggle for civil rights. And their response was undisguised disdain. The slogan, "God created Adam and Eve, not Adam and Steve," became a mainstay of sermons as a result. Sadly, instead of addressing the controversy surrounding homosexuality with arguments of substance, these black ministers, backed by scripture, chose to play the "God card." In their minds - and in the minds of many in their congregants - the invocation of this simple catchphrase marked both the begining and end of any discussion gay rights: homosexuality is ungodly; God said it; I believe it; and that settles it. So it was with some consternation that I listened as the speaker at the GYRE Symposium chose to play the God card, too. During a comment on GMOs (Genetically Modified Organisms), he paused, lowered his voice, and confided conspiratorially with the audience, "you know what the plant scientists and the soil scientists think GMO stands for? They think it stands for God Move Over." As the audience laughed and applauded, my dismay only grew. Many people in the auditorium reached for pen and notebook or smartphone or tablet to take down the speaker's exact words so that they could use it later on in their own advocacy. This was apparently a slogan with legs. Now there are many dimensions to the controversy that surrounds genetically-modified crops, ranging from concerns about food safety to the possibilities of unintended environmental consequences. Some see GMOs as the way agricultural giants like Monsanto will continue to tighten their grip on agricultural markets which they already dominate, much to the disadvantage of both farmers and consumers. Others see GMOs as our best hope for feeding a growing global population, forecast to reach 11 billion people by the end of this century, and to do so while simultaneously reducing the use of pesticides, conserving water, and retaining valuable topsoil. But whatever one's opposition to genetically-engineered food is, any argument should be rooted in the scientific evidence and commonly-held secular values and not be based on an arbitrary notion of what God would or wouldn't want. 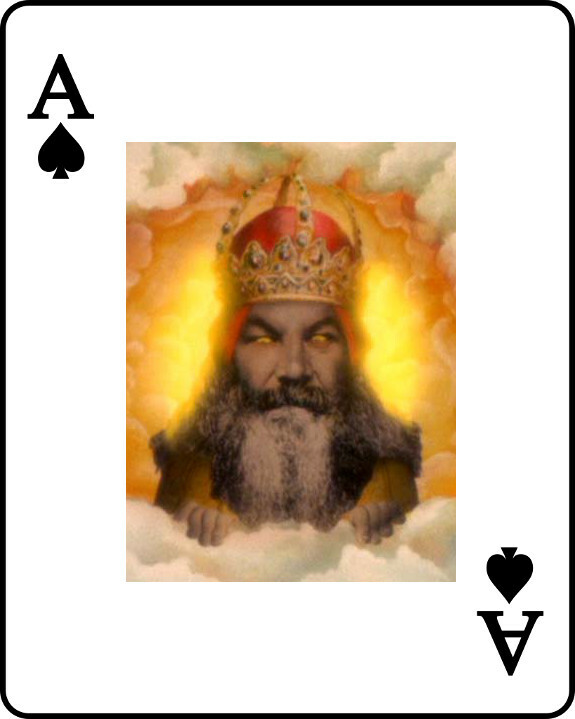 Playing the God card has never helped in resolving any real-world problem. It maligns those with opposing points of view, casting them as blasphemers. (This can be a death sentence in some cultures.) In the case of "God Move Over," plant scientists and soil scientists are derided for having the arrogance to usurp God's authority, to play God, as it were. This may come as a surprise to some of them who no doubt believe they are doing God's work by striving to devise ways for future generations to be able to enjoy good nutrition while minimizing the harm to the environment required by large-scale expansion of agriculture. We should always look beyond amusing slogans that oversimplify complex problems. Sometimes both God and the Devil reside in the details. It's time to place the God card back into the deck and leave it there where it belongs.